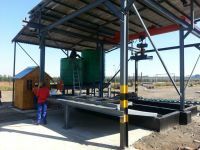 A new Treament Plant was erected at Kemp Mill near Piet Retief in April 2013. The project only took a month to complete. Well done to the guys, the Plant came out the best out of the six treatment plants of Timrite.